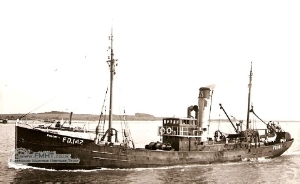 4.3.1911: Launched by Cochrane & Sons, Selby (Yd.No.479) for The Mount Steam Fishing Co Ltd, Fleetwood (George E. J. Moody, Grimsby, manager) as PHRONTIS. 30.3.1911: Registered at Fleetwood (FD142). 10.9.1914: Requisitioned for war service as a minesweeper (1-12pdr) (Ad.No.520). 16.3.1918: In Loch Eriboll at 5.30 am. in collision with VULTURE II (Ad.No.310) (H470) which foundered. All crew saved and brought in to Long Hope Bay. 1919: Returned to owner (Sir George E. J. Moody, Grimsby, manager). 193? : W. M. Kelly designated manager. 13.10.1935: Sailed Fleetwood for West of Scotland grounds (Sk. E. Westhead). 19.10.1935: In heavy seas, Robert Turner (40), Mate and James Damerell (45), deckhand were washed overboard and drowned. January 1946: Returned to owner (Will B. Moody, Grimsby, manager). 1955: Sold to Scrappingco S.r.l, Antwerp for breaking up. 18.10.1955: Arrived Boom for breaking. BLONDE, Arsène J.A., Ty/Act/Boatswain, RNVR, D/SB/JX 357, Phrontis, 9 August 1944, died - (member of the Royal Navy Section Belge).